Rep. Jason Chaffetz, R-Utah, added to his earlier articles of impeachment against the commissioner a resolution that, if passed by the full House, would call for his resignation or removal and the forfeiture of his pension and other federal benefits. The move comes a week before the House Judiciary Committee is scheduled to hold a hearing on Koskinen’s degree of cooperation with Congress during the three-year-old investigation of alleged political bias in the IRS’ handling of applications for tax-exempt status by primarily conservative nonprofits. “I view censure as a precursor to impeachment as it allows the House the opportunity to formally condemn Mr. Koskinen,” Chaffetz said. The oversight committee members said Koskinen also falsely testified that the IRS turned over all emails relevant to the congressional investigation, falsely testified emails were unrecoverable once the agency realized on March 4, 2014, that some of Ms. Lerner’s emails were missing, and did not notify Congress the emails were missing until June 2014. 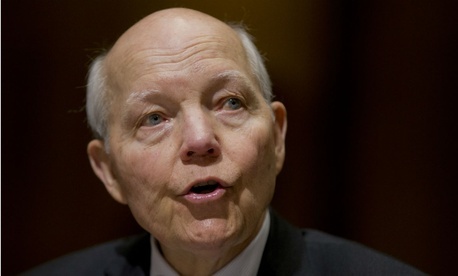 The IRS has not committed to having the agency head appear at next week’s hearing. “Commissioner Koskinen has cooperated with the four congressional investigations triggered by the inspector general’s report three years ago on the handling of applications for determinations by social welfare organizations, and he will continue to do so,” the agency said in a statement to Government Executive.